The North Face of the Eiger — also known by its more charming moniker, the Wall of Death — is one of climbing’s most iconic faces. It was first climbed in 1936, and since then, has claimed the lives of dozens of alpinists. These 360-degree videos bring that sensation of pure, unbridled terror right into your living room. The videos were made by Swiss company Mammut, which has something of a history with the mountain. 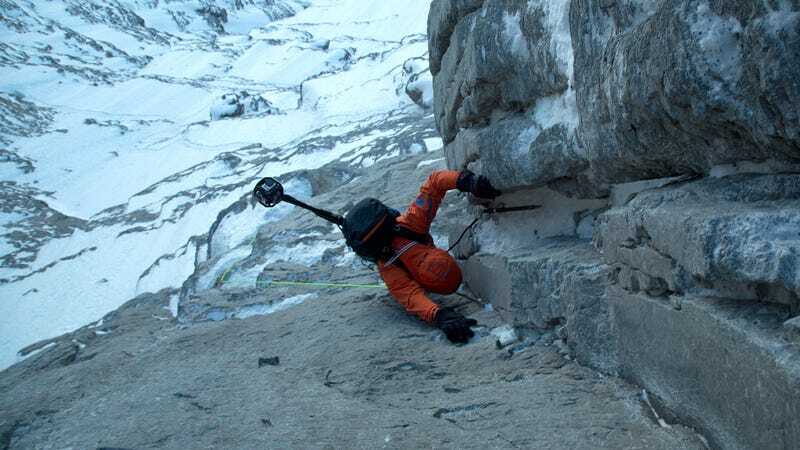 A team of climbers took 360-degree cameras, mounted to their backpacks, up the entire route of the 2-day climb, ticking off iconic names as they went: Difficult Crack (one hell of an understatement), the Hinterstoisser Traverse; Death Bivouac. The videos give a real sense of perspective of a climb, the ups and downs that go with being safe one moment, and perilously close to death the next. The sequence in the Difficult Crack shows it well: look up, and the climber’s just meters away from the rest of the camera team, looking relaxed and chilled out. Look down, and it’s thousands of feet of sheer cliff, with one lonely piece of protection stuck in the wall. Once you’ve watched Mammut’s videos, and thoroughly terrified yourself, go look at this: Swiss climber Ueli Steck, doing the route — which takes fast, experience climbers at the top of their game two days — in two goddamn hours. Without ropes.